For those with serious, even life-threatening, allergies to foods, this official statement (confirming the 8 allergens that are not present in the plant where the Juice Plus+ Chewables are manufactured) is very important. 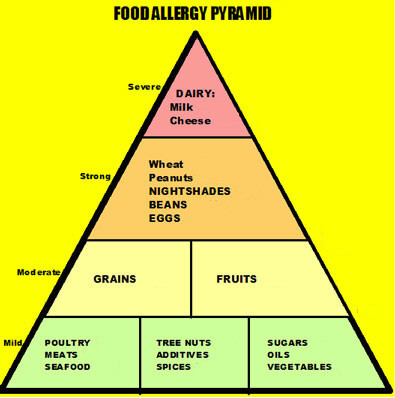 It helps to understand the difference between allergy, intolerance and sensitivity to food; this article about these in children helps, and most of it applies equally to adults. We have come across quite a few people who say they are allergic or sensitive to one or more of the fruits and/or veggies that are in Juice Plus+, yet they generally have no problem with Juice Plus+. There are good reasons for this; with the capsules there is no contact with the offending item in the mouth (one possible cause), and there is no possibility of the body reacting to undigested proteins (another likely cause), because the ‘juicing’ process breaks down the cellular structure of the fruits and vegetables. The most important thing is that Juice Plus+ will eventually re-balance their immune system and internal chemical system, so the sensitivity should reduce and eventually go away. We always first determine how severe the problem is; obviously if it’s life-threatening or a severe reaction then we would not recommend they try Juice Plus+. If the sensitivity is not all that severe (just annoying), then one fruit capsule one day, and one veggie capsule the next for a week or so, should do it. In all other cases, we suggest the person start slowly, with ONE fruit capsule or chewable (1/2 the amount in a capsule) one day, then if all is ok, one veggie the next day, and so on, building up gradually (increasing the amount every 5-7 days) until he can take 2+2 capsules or 4+4 chewables. Those people with severe peanut or shellfish allergies should be aware of the warning on the labels of our Juice Plus+ Complete drink mix and bars: “Produced in a facility …”. However, this Statement from the company should resolve most concerns. I was asked to respond to your questions about allergy to Juice Plus+. I now have nearly five years of experience providing Juice Plus+ to my patients. Additionally, I rely on numerous physicians and dentists for their input on problems such as allergies. The sum of this experience is that allergic reactions are rare and have been minor of source. We exclude those people at the outset who are allergic to one of the components of Juice Plus+, so we generally don’t tempt such occurrences. I have had one case of perioral inflammation with itching, which was related to the fruit capsule. I have not heard of anyone having hives or arthritic symptoms. One patient had diarrhea, which we almost labelled allergy, but it finally disappeared after 3 1/2 weeks of persistence with Juice Plus+. I have not heard of nasal congestion associated with Juice Plus+, but I’ll add it to this short list. When there is a question of a possible reaction, I advise eliminating the fruit capsules for several weeks to see if the reaction disappears. If it doesn’t disappear, then resume the fruit capsules and leave off the vegetable capsules for several weeks. If the problem still persists, I have them empty the capsules (beef gelatin) and use only the contents. If the cause and effect scenario still persists, then we can call the nasal congestion, or whatever, an allergic response. Last we might follow the allergist’s technique: determining what the allergen is and then giving small but increasing amounts over a period of time to desensitize. On the flipside, I have heard of several people who professed to be allergic—one to orange and one to tomato—who were not allergic to Juice Plus+.